Permitted graffiti on derelict buildings in Hull has caused a drop in anti-social behaviour, according to the fire service. 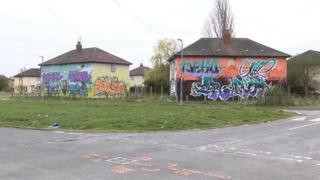 Hull City Council has allowed graffiti artists to illustrate boarded up houses awaiting demolition on the Preston Road estate. Dave Collingwood, manager of East Hull Fire Station, said incidents of arson in the area had dropped. The properties are being demolished to make way for new social housing. Artists from the Bankside Gallery began painting on the houses last summer. The organisation was set-up to provide support to street artists after a Banksy mural was painted on a disused bridge by the River Hull. Mr Collingwood from Humberside Fire and Rescue Service said he would like to see the scheme extended to other parts of the city. "We've seen a really significant decrease in not just the actual arson in the area but the anti-social behaviour as well," he said. "For example in the Marfleet area we've seen around a 41% reduction, which is huge. "You could argue that Banksy has done us a fantastic job."